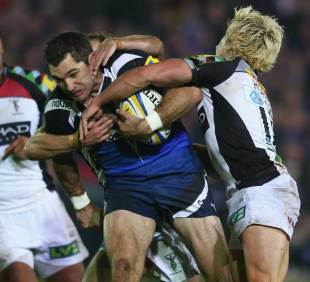 Bath have confirmed World Cup winning fly-half Stephen Donald will leave the club at the end of the season. The New Zealander will join Japanese side Mitsubishi Dynaboars, who counted former Wales wing Shane Williams and ex-England fly-half Dave Walder among their squad last season. The 29-year-old arrived in Bath after kicking the winning penalty for the All Blacks in the World Cup final in November 2011. He has since made 31 appearances for the club, scoring more than 150 points. Donald's departure will leave young fly-half Tom Heathcote competing with George Ford, who is set to move to the Rec from Leicester Tigers at the end of the season, for the No.10 role next season. Donald said: "I've had a great time with Bath, but feel it is time for a new challenge in a new league. I'd like to thank everyone at the club and all the Bath supporters for all the support during my time here, and I'm really looking forward to doing all I can to help us end this season on a high." Bath head coach Gary Gold added: "Steve is a good footballer and is a great character to have around. He has brought a lot of experience to the squad in the last couple of years, and we wish him all the best of luck in Japan next season."